This is a very nice flat located close to Santa Maria Maggiore we only stayed one night but it was fresh, clean and cool in the heat of July . There are restaurants around plus a good supermarket and there is good access to Rome¬s sights both on foot and by transport There was a friendly welcome too. Great stay here! 10 min walk from the train station and about 15min walk to the colloseum! Monica was lovely and so friendly and set us off with a wonderful energy full of Italian hospitality! Our room was super clean and shower and facilities were great! Large room with a nice window lookout and cute coffee/tea chairs in the room with our own espresso machine! Would stay again for sure! The room was very clean and spacious. The facilities were very good for that price range room and included TV, mini fridge and safe. Tea and instant coffee were always available. The owner of the lodge is a very nice lady and very helpful. There are some very good restaurants around it also some supermarkets. Its very close to Metro station and the most of touristic attractions and famous places are in walking distance. Great service. Love this place and Monica is really helpful and so nice. Thanks. Awesome host! Super nice, super knowledgeable, and very attentive with communication. Will book again for sure! Nothing but good vibes! 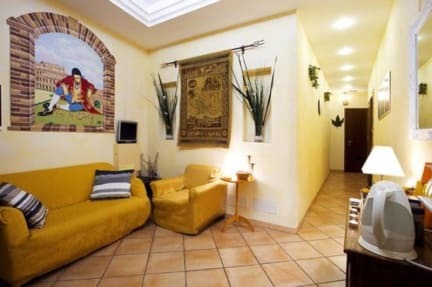 Really good location, is 10 minutes walking from Termini and 5 minutos walking from se colisseo. Very clean! We had a lovely time here. We chatted with Maria at check-in for ages, and she felt like an old friend. The pink room we had was on the first level, was tiny, but worked for what we needed. In such a great location, we must have walked 25km a day just exploring. There's no free breakfast included which is a bit misleading. No common area to meet other people either, more of a guest house. Great if you want privacy! The best thing about our stay was Monica! :D she was super helpful and very friendly, recommended us places to visit on the map, and very easy to contact via Whatsapp. The location of this place is ideal, 10 mins from Terminii, near some nice restaurants, and only a short walk to the Colosseum and into the city centre! Buses also run from the the Campo di Flori back to Terminii, which is handy. All in all, a decent sized room with good facilities - ideal for couples and families! We booked our stay online rather last minute, and since they don't have a reception available, we had some trouble getting a hold of someone to get checked in, but after that, it was a pleasant room in a nice location. There was a kettle for instant coffee and tea rather than a real breakfast, but the minifridge in our room was handy. It was perfect for our weekend passing through Rome.